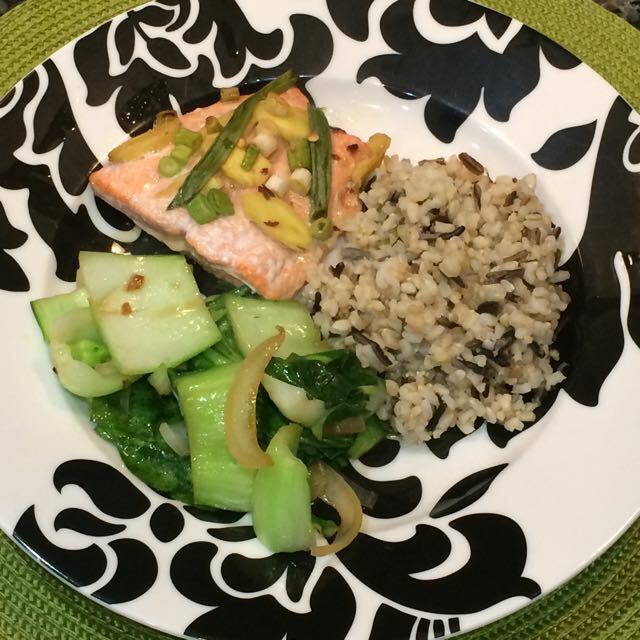 You are here: Home / Blog / Baked Ginger Salmon with Bok Choy and Rice for Dinner Tonight! We usually have salmon about once a week, always looking for good deals on wild-caught Alaskan or Pacific salmon that’s a deep reddish pink in color. “Atlantic” salmon is the term typically used for farm-raised salmon, which may or may not be a good choice, depending on the grower. Here are a few key points to be aware of when you’re buying salmon. Farmed salmon is fed a processed diet, which can very from farmer to farmer. Wild salmon eat their native food in the wild. Therefore, wild salmon is higher in nutrients including the all-important omega 3s. They have less omega 6 and a much better 3:6 ratio. (The processed food fed to farm-raised salmon increases the levels of omega 6s, of which most Americans already eat too much.) Farmed fish is higher in fat (from the omega 6s), which is why you see more streaks of white thought the filets. Accordingly they are higher in calories. Farmed salmon must be given antibiotics on occasion due to overcrowding and disease, and some countries have little to no regulations regarding antibiotic use. Countries with the strictest laws and lowest rates of antibiotic use include Canada and Norway. Chile, where much of the farmed salmon is produced, has very few restrictions, and higher levels are found in their fish. Contamination is a problem with farmed fish, especially in countries with few regulations. Typical contaminates are PCBs and pesticides. Do your research. If you shop carefully, eating farmed salmon is still considered more beneficial than not eating any, and it’s less expensive. If you can afford wild-caught though, go for it! If you want to learn more about wild salmon vs. farmed, see this article: Wild vs Farmed Salmon: Which Type of Salmon Is Healthier? Our Baked Ginger Salmon recipe is only available in the Finite Foodie Cookbook, so be sure to pick up a copy. 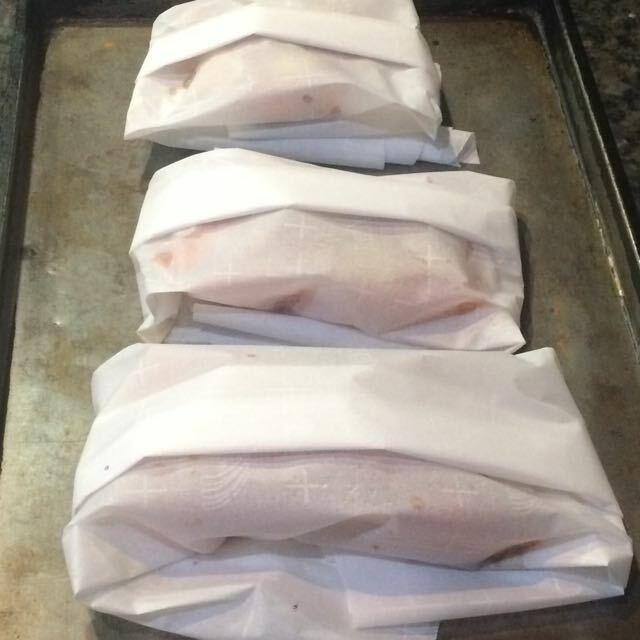 In the meantime, we have other salmon recipes on our website for you to enjoy. Bok Choy is one of our favorite vegetables. It’s quick and easy to cook and is a nutrient-dense, but low-calorie food, packed with vitamins A, C, and K, as well as phytonutrients that have cancer-protecting properties. To prepare, we cook a little garlic in olive oil, stir in the bok choy, cook for a few minutes, then add a small amount of water. We cover it to steam another minute or two. Add soy sauce or a little salt and perhaps some red pepper flakes, to taste. This Chinese-inspired meal goes beautiful with fresh fruit for dessert, or if you want to get fancy, try our Fancy Baked Apples with Dates and Rosemary. If you want a fun, but simple meal to serve for the Chinese New Year, this menu is a great choice!